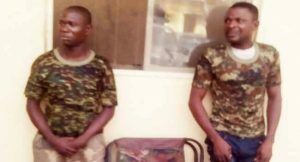 The Ogun State Police Command says it has arrested two persons who have allegedly been parading themselves as officers of the Nigerian Army in order to extort and maltreat innocent citizens in Agbado area of Ogun state. 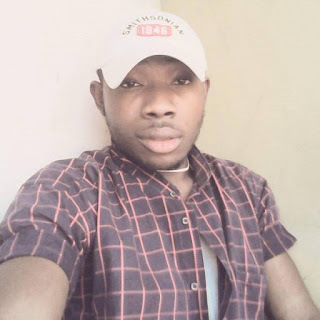 In a press release by the Police Public Relations Officer, Mr Abimbola Oyeyemi, it was stated that, “the two men, Joseph David and Adebayo Olanrewaju Ojoye, were arrested following a complaint from Barrister Paul Oniyo and Chima Solomon, that the two suspects who put on military camouflage accosted them, beat them up and inflicted injuries on them over a minor disagreement. ”Upon their complaint, the Divisional Police Officer, Agbado Division, (CSP) Abioye Shittu, led detectives to the scene where the suspects were arrested and brought to the station. “On interrogation, it was discovered that the suspects acclaimed military men were mere impostors thriving on illegality for sustenance”. the P.R.O said. Items recovered from them include: various military hard wares, cap and camp bed. The Commissioner of Police, Ahmed Iliyasu, has now ordered the immediate transfer of the suspects to State Criminal Investigation and Intelligence Department for further investigation.